You know better than anyone that keeping the kids’ attention is no easy task, but don’t worry about that here. 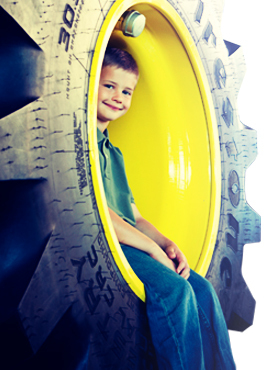 At the John Deere Pavilion, your kids can power-up virtual reality simulators, climb into huge machines, watch videos on our giant media wall, discover futuristic designs, connect with machines from the past, interact with hands-on displays – and even learn a thing or two along the way. The John Deere Pavilion truly is an adventure like none other. No wonder it’s one of the state’s top tourist attractions.